Cartilage defects acquired through the wear and tear of everyday life ultimately contribute to osteoarthritis (OA)--the most common form of arthritis and a significant source of disability and impaired quality of life. With recent generations of active and athletic individuals, the number of people with OA is substantial, and often affects younger adults for whom joint replacement is not a desirable treatment option. 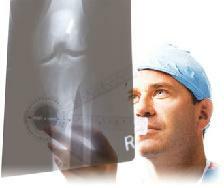 Rush University Medical Center's bone and joint program has a distinguished history of "bench-to-bedside" or translational research, wherein laboratory discoveries are brought directly to our patients, while clinical findings contribute to further research innovations. A strong collaboration between sports medicine physicians in our department of orthopedic surgery and basic scientists has facilitated major innovations in treating patients with cartilage defects thus far. The Rush team's focus is now on developing ways of preventing further degradation and delaying the need for surgical intervention in patients with cartilage defects. Investing in the laboratory and clinic will help expand the current array of minimally invasive repair options. Currently, in Rush's Cartilage Restoration Center, a common procedure is for physicians to surgically insert a plug of cadaver cartilage and bone into the joint of a patient with damaged cartilage with the hope that it heals to the surrounding bones. The fact that the procedure is somewhat invasive and the implant is clinically effective in only 75 to 85 percent of the patients has prompted the need to develop better ways to treat such injuries. Dr. Brian Cole is also at the forefront of autologous chondrocyte implantation (ACI), a procedure where cartilage is taken from a non-load-bearing part of the patient's own body and is stimulated to grow new cartilage cells in a laboratory. In a second surgery, the patient's own cartilage is inserted into the injured area. This procedure is not always successful either, and can only be used in patients whose cartilage damage is minimal. The most common complication is the failure of implanted cells to integrate and possibly, the need for additional surgery to remove scar tissue in the joint. Your donations to the LiveActive Fund will help generate the much needed funding to address these problems and to advance orthopedic research, education and create awareness for alternative treatments, therapies and training to allow people to resume an active lifestyle. To date, fundraising has largely been used to investigate improvements and alternatives to existing technologies. Several projects are currently slated that are in dire need of additional funding to facilitate their completion. Avoiding invasive surgery and transplantation altogether, there is an opportunity to explore the use of the patient's own plasma and platelets to generate new cartilage growth or reduce the inflammation and pain associated with arthritis in a damaged joints. By taking a patient's blood, separating the plasma and platelets and injecting them into the site of the injury, the idea is that the condition of the joint can be improved without invasive surgery. Research would focus on developing tools to monitor the effectiveness of this approach - for example, a pain scale, and the identification of specific bio-markers in synovial fluid - in order to create the optimum protocol. Clinical studies in this area are currently being developed to harness information learned from our laboratories. These studies will require signficant funding to conduct over the next 3 years. "There have been few controlled clinical trials, and results are inconsistent, but data so far suggests that it could be a promising treatment for healing in a variety of tissues," said Dr. Brian Cole, orthopedic surgeon and head of the Cartilage Restoration Center at Rush. "The therapy will not be a cure for osteoarthritis, but it could help put off the day when a patient will need to get a knee implant." If you have shoulder pain due to a rotator cuff injury you may be eligible for a study on new treatments. The Stem Cell Trial is a new approach to the treatment of rotator cuff tears. To be eligible for the study, you must: have shoulder pain, be between ages 18 and 70, be willing to undergo initial evaluation and imaging to determine if your pain is caused by rotator cuff injury and be a candidate for surgical rotator cuff repair. If you are interested in this trial and wish to schedule an appointment for evaluation of your shoulder pain to find out if you are eligible for the Stem Cell Trial, please contact Midwest Orthopaedics: shoulderstemcells@rushortho.com. All donations are tax deductible as allowed by law. To donate please click the 'Make a Donation' button in the upper right side of this page.